Building a new home for the future of furniture. Burrow was recently featured in the New York Times Magazine Design Issue. Check it out! 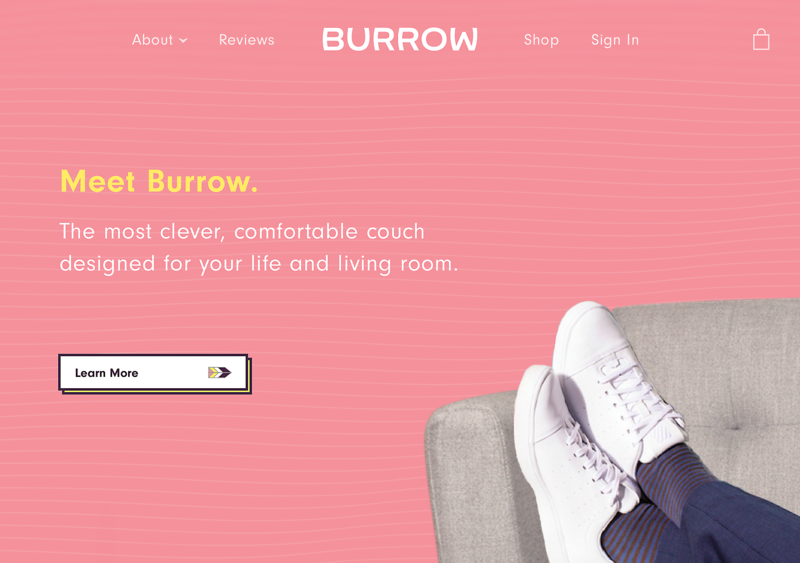 Burrow is a Y Combinator graduate that is upending the furniture industry by building high quality, mid-century modern sofas, shipped directly to consumers, at a fraction of competitor's prices (think CB2 and West Elm). To expedite launch and begin proving the concept, Burrow cobbled together a bare bones Squarespace site. 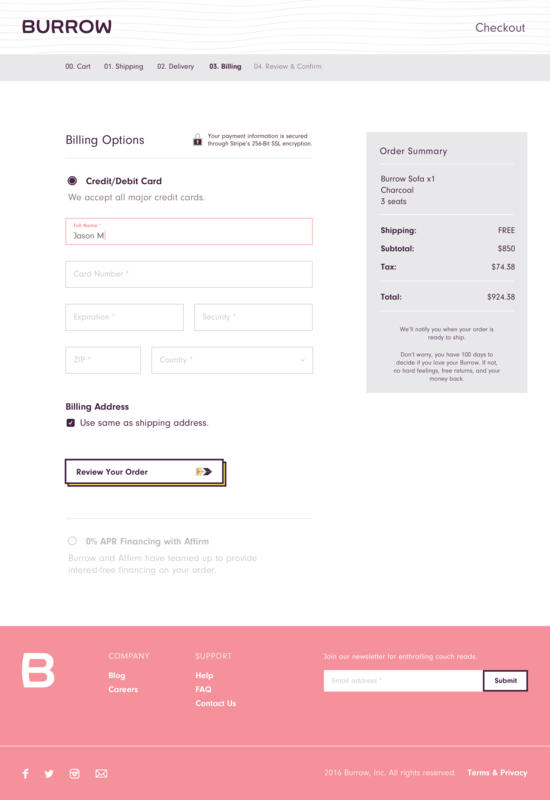 Mounting preorders and a strong vision got them into Y Combinator, but upon graduating the founders (Steve and Kabeer) knew they had to invest in a digital makeover to join the ranks of today's e-tail heroes like Warby Parker and Everlane. I was lead product designer and project manager working alongside a developer. I made all UX and UI decisions and wrote copy in the brand's voice, which was defined in a recent brand system. For a brand like this, product and lifestyle photography should do most of the talking. (Good) photography is transportive. It stirs the imagination, invoking a sense of desire to be inside of the scene. 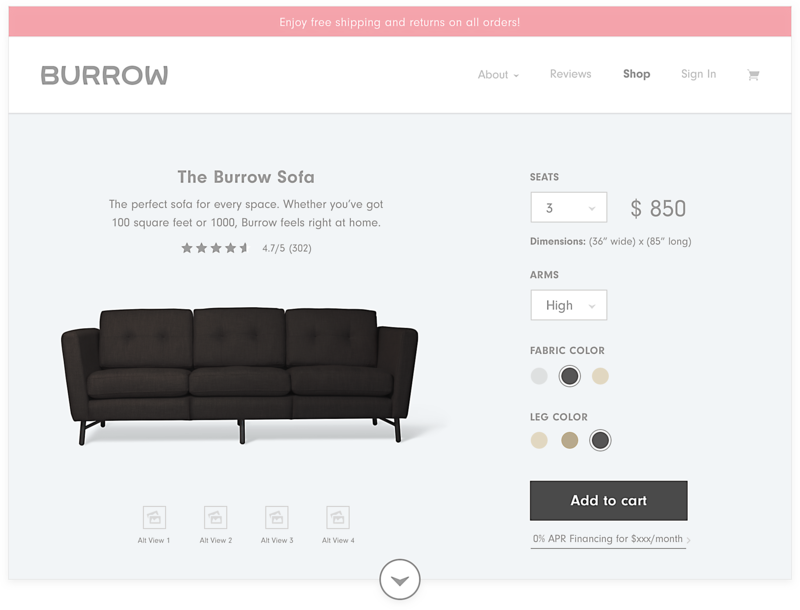 This is exactly what we wanted to achieve with the Burrow site...this sensation would build comfort with buying their furniture online. Wireframing was mostly about establishing visual hierarchy and getting copy right. Copy is especially important for this brand. It has to make visitors love the idea of owning a Burrow sofa, cushion untouched. It has to make them confident that Burrow is about to send them the best couch they've ever had. Call us crazy, but we think you shouldn’t have to (or want to) get rid of your couch every time you move. 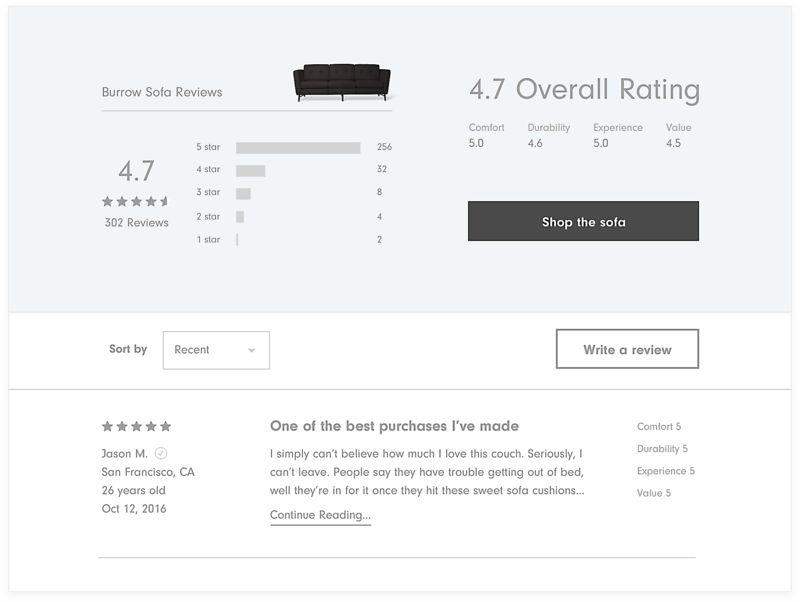 We specifically designed the Burrow sofa to move with you and make friends with every floorplan. We started by understanding what you think is wrong with furniture, physically and experientially. We’re building a company committed to making things right and furniture that makes home happier. We wanted to build a sofa for every body, that’s universally loved yet uniquely you. The Burrow sofa’s modular design matches your style today and gives you the freedom to mix and match forever after. Testimonials are another way to build trust and certainty. Making such a significant purchase online may give understandable pause, so bringing human voices into the consideration process can create a sense of kinship, which in turn breeds comfort. To honor Burrow's design style, I wanted to bring some Mid Century Modern flair to the nuances and textural elements of the site. Inspired by the interior design of my favorite architect, Frank Lloyd Wright, I created a series of geometric icons for application across the visual design. Explorations above and in action below. Another web trend we observed and collectively liked is the quirky 404 page. I proposed a haiku and Kabeer had the excellent idea to make it about change that gets lost in the couch. Not sure what this says about me, but that got me thinking eulogy. Poor change. change your old couch ate. This project gave me a firsthand look at how difficult it is to start a business or be a part of a fledgling startup. The litany of daily challenges early stage companies face reinforces the importance of learning how to roll with the punches. Working so closely with an engineer has also been a very valuable learning experience. Because of this project, I'm getting better at asking questions, surfacing and resolving concerns, and understanding the opportunities and limitations of the web.